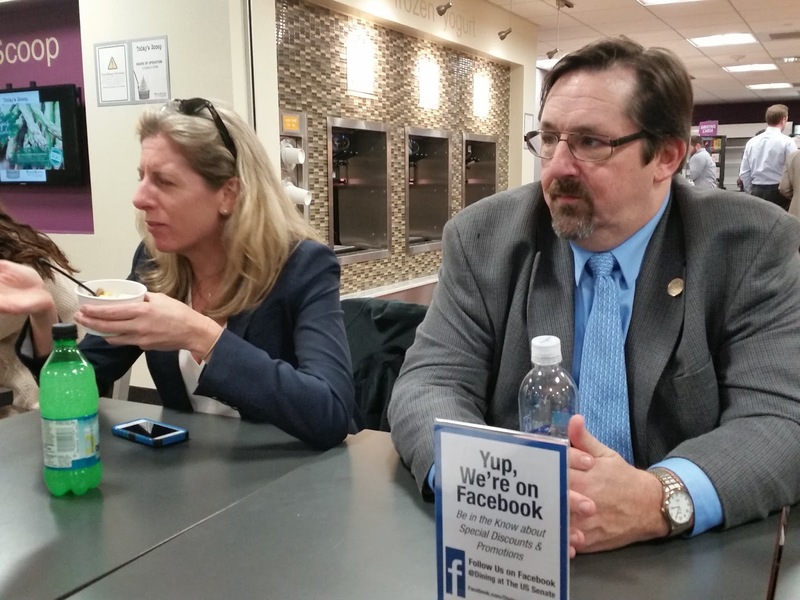 Advocating for the fish: Meghan Jeans of the New England Aquarium and Patrick Paquette, a recreational fisheries representative from Hyannis, MA, take a break in the U.S. Senate cafeteria. Nice brace of trout: Billy Enright of Cranston holds a nice brace of trout the he and friends Autumn Mitchell and Mike Manco (also of Cranston) caught by 6:30 a.m. on Opening Day. 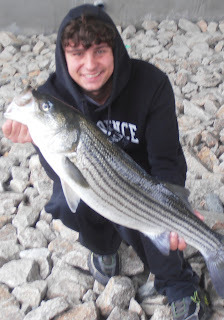 Keeper bass in Bay: Brandon Hagopian of Cranston with a keeper striped bass he caught last week in the upper Bay. No lice on the fish indicate that it was likely a hold-over bass and not a migrating fish. First Opening Day trout: Liam Farrell (age 13) proudly displays his first trout with Uncle Sean FitzGerald (both of Jamestown) as they fished with Alex (age 9) and Steve Greenberg of Narragansett. What a celebration I attended this week. April 13th was the 40th Anniversary of the Magnuson-Stevens Act (MSA), the fishing law of this Nation. The celebration was held in Washington, D.C. sponsored by six conservation groups lead by The PEW Trusts. Like all anniversaries it was a time for reflection. To reflect on how successful the act has been and how it needs to be adjusted in the future. The MSA and its reauthorizations provided the teeth needed to set firm allowable catch limits (ACL) which directly lead to 39 fish stocks being rebuilt today. So we need to keep this law strong, and make sure it continues to eliminate wiggle room so fishermen and fish managers have firm catch limits to continue to rebuild fish stocks. Additionally, moving forward MSA needs to be adjusted to include things like enhanced forage fish protections, stronger by-catch provisions and most important a big-picture eco-system based management planning strategy. We need an eco-system based management strategy because climate change and warming water has forced some fish out of our waters and forced other species (like black sea bass and summer flounder) into our area in greater numbers and present fisheries management strategies are not handling these changes. Climate change, forage fish, stronger bycatch provisions are not consistently incorporated into a big picture management strategy and plan. The 40th Anniversary celebration of the MSA in Washington this week included informational meetings with members of congress and their staff. Our Rhode Island, Massachusetts and Connecticut congressional delegations and staff members met with representatives from the commercial and recreational fishing community, the New England Aquarium as well as a number of conservation groups in New England to reflect on MSA successes and future adjustments needed. So happy 40th Anniversary to the Magnuson-Stevens Act. You have served the fish well. 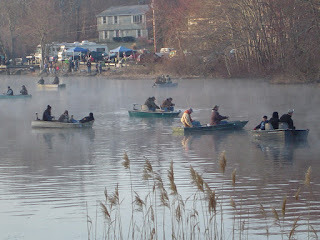 The Opening Day of trout season this past Saturday was a big success. “I got one” said Liam Farrell (13 years old) from Jamestown as his uncle Sean FitzGerald looked on with pride. It was Liam’s first Opening Day fishing experience. “It was tough getting up early but well worth it.” said Liam. Billy Enright of Cranston said, “We have been coming here for ten years. We haven’t missed a year. The three of us have about a dozen fish so far.” It was 6:30 a.m. and they had been fishing for about 30 minutes. The Rhode Island Department of Environmental Management (DEM) did an outstanding job stocking ponds with 80,000 hatchery raised brook, brown and rainbow trout this year. Over 100 waterways have been stocked and this year three new locations were stocked on the Ten Mile River, marked by white trout fishing signs, include the intersection of 114A and Hunts Mill Road and just below the John Hunt House at 65 Hunts Mill Road. Visit www.dem.ri.gov for a complete list of stocked ponds. The scope of the draft Safety Area (a 500 yard safety zone) that the USCG has published in the Federal Register pertaining to the Block Island Wind Farm (BIWF) and the sea2shore cable run was clarified last week by Ed Leblanc (USCG). In a note to Elizabeth Marchetti, fisheries liaison, from Mr. Leblanc said "The Coast Guard's intent with respect to the proposed safety zones is to enforce each individual safety zone only when construction vessels are on-scene at an individual turbine. As discussed in the proposal regulation, the Coast Guard intends to create individual, 500-yard radius, safety zones around each turbine. In essence, five safety zones, one for each turbine. Vessels (other than BIWF construction vessels) will be precluded from entering safety zone only when construction vessels are on scene. So, for example, if there are construction vessels working on turbine #3, but no work vessels at any of the other turbines, mariners must stay at least 500 yards away from turbine #3, but are free to approach as close as they want to turbines #1, 2, 4, and 5 (consistent with prudent and safe navigation, of course). If there are work vessels at both turbines #1 and #2, mariners must remain clear of those two turbines but have full access to waters around the other three, and so on." A copy of the Federal Register Notice and the place to submit comments on the proposed regulation by April 17th is https://www.regulations.gov/#!documentDetail;D=USCG-2016-0026-0012. The Rhody Fly Rodders will hold their annual cookout get-together on Tuesday, April 19th at 6:00 p.m. Members, guests and new comers are welcome to attend, enjoy the food and talk about the upcoming fishing season. A short film about fly fishing adventures will be shown, followed by a brief presentation by Mike Bucko who heads of DEM’s new department administering the Access Point Angler Intercept Survey (APAIS). The meeting will take place at the Riverside Sportsman’s Association, 19 Mohawk Drive, East Providence. Contact president Peter Nilsen with questions at pdfish@fullchannel.net. Cod fishing remains good in local waters offshore. Boats did not sail often last week due to bad weather, but when they fished boats had fair trips, with lots of bait and cod on fish finders. With improved weather all hope the good cod bite continues. Opening Day at Silver Spring Pond, South County provides a carnival like atmosphere with overnight camping, early morning breakfasts and fishing at 6:00 a.m.
Brandon Hagopian of Cranston with a nine plus pound bass he caught last week in the Pawtuxet River using a topwater lure. The Department of Environmental Management’s (DEM) is ready for Opening Day this Saturday, April 9. DEM has stocked over a hundred local ponds, lakes and waterways with 80,000 trout. Bait and tackle stores are ready too and have stocked up with gear, baits of all types and fishing lures designed to put trout in you bucket. Opening Day fishing is a tradition passed on from fathers and mothers to sons and daughters. Anglers from seven to seventy years old fish opening day of trout season because it signifies the start of the fishing season and our reconnection with nature in the spring. It also allows friends and family members to talk, get to know each other better and bond as they creative opening day fishing memories that will last a life time. Hatchery-raised brook, brown, and rainbow trout with an average individual weight of about one and a half pounds have been stocked by Fish and Wildlife Division staff in ponds and streams for opening day. Gail Mastrati, a DEM spokesperson said “We have a complete list of ponds that have been stocked for opening day on our website at www.dem.ri.gov.” Several of these ponds and waterways will be stocked a second and third time during the season. There is no minimum size for trout and the creel or bag limit is five fish from April 9 to November 30, and two fish from December 1 to February 29. 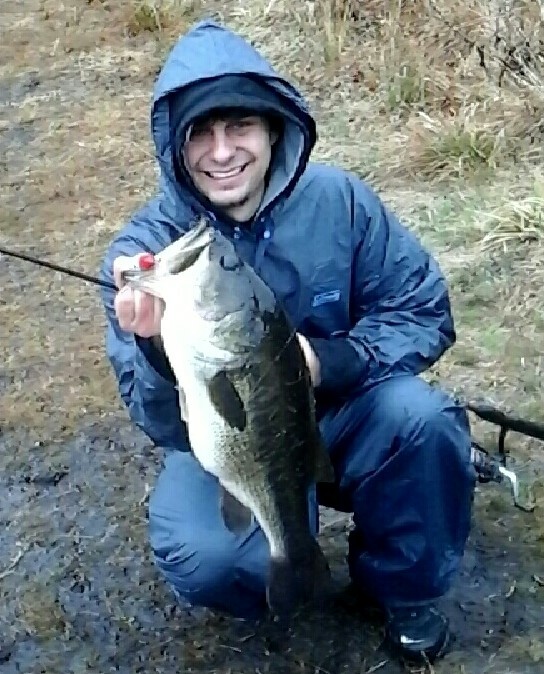 There is no closed season for largemouth and smallmouth bass in Rhode Island, 12” minimum size for both with a bag limit of five fish/angler/day. Northern pike minimum size is 24”, no closed season with a two fish/angler/day limit. And, chain pickerel has no closed season, minimum size is 14” with a five fish/day/angler limit. 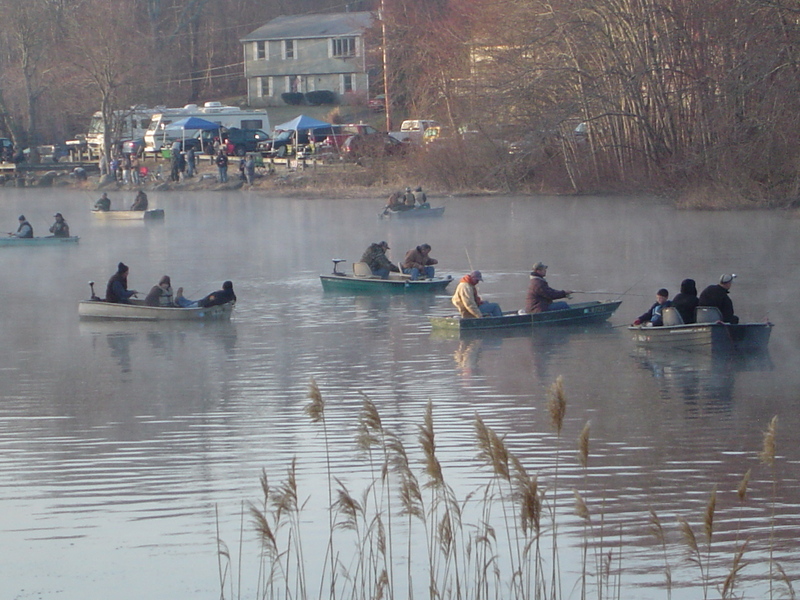 Some of the more popular ponds DEM plans to stock prior to Opening Day include: Barber Pond, South Kingstown; Carbuncle Pond, Coventry; Chickasheen Brook, South Kingstown; Frenchtown Park Pond, East Greenwich; Hunt River, East Greenwich and No. Kingstown; Meshanticut Brook, Cranston; Moosup River, Coventry; Pawcatuck River in several towns; Silver Spring Lake, North Kingstown; Tiogue Lake, Coventry; Eight Rod Farm Pond, Tiverton; and Saint Mary’s Pond, Portsmouth. Other popular trout ponds include Willett Pond, East Providence and Simmons Mill Pond in Little Compton. Ponds open for only children 14 years of age and younger for the first two days of the season (April 9th and 10th) include: Cass Pond, Woonsocket; Frosty Hollow Pond, Exeter; Geneva Brook & Pond, North Providence; Lapham Pond, Burrillville; Lloyd Kenney Pond, Hopkinton; Ponderosa Park Pond, Little Compton; Seidel’s Pond, Cranston; Silvy’s Pond, Cumberland; and Slater Park Pond, Pawtucket. A 2016 fishing license is required for anglers 15 years of age and older wishing to catch fish. A Trout Conservation Stamp is also required of anyone wishing to keep or possess a trout or to fish in a catch-and-release or 'fly-fishing only' area. Fishing licenses and the Trout Conservation Stamp ($5.50) can be obtained at any city or town clerk's office or authorized agent such as bait and tackle shops, Wal-Mart and Benny’s. A current list of license vendors is available on the DEM website. Licenses may also be purchased on line or obtained at DEM’s Boat Registration and Licensing Office located at 235 Promenade Street in Providence. License fees remain at $18 for Rhode Island residents and current members of the Armed Forces, $35 for non-residents, and $16 for a tourist three-consecutive-day license. Anglers over 65 must have a license, which for them is free, but do not need a trout stamp. Winter flounder season runs from March 1 to December 31. However, anglers are reminded that it is illegal to catch winter flounder in Narragansett Bay. Winter flounder regulations state, “The harvesting or possession of winter flounder is PROHIBITED in Narragansett Bay north of the Colregs Line of Demarcation as well as in Potter and Point Judith Ponds.” So the east to west Colregs Line at the mouth of the Narragansett Bay is drawn from Brenton Point in Newport, through Beavertail Light to Boston Neck in Narragansett. Anything north of this line cannot be fished for winter flounder. ” John Littlefield of Archie’s Bait & Tackle, Riverside said, “An easy way to tell the difference between winter flounder and summer flounder (fluke) is that winter flounder has a black back and a small mouth, summer flounder are lighter in color (shades of brown) and have a larger mouth with visible teeth.” The minimum size for winter flounder is 12” with a two fish/angler/day limit in legal waters. 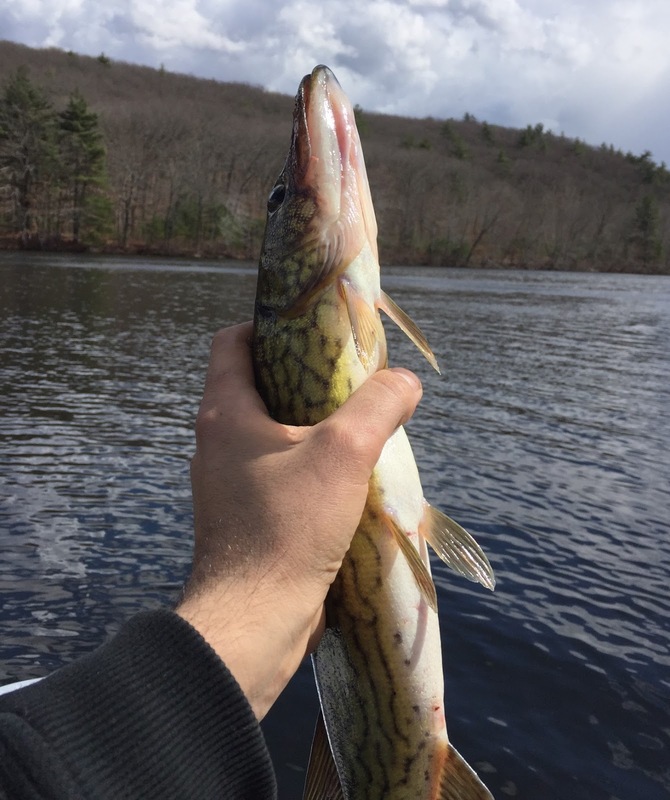 Omar Curi of Providence caught this pickerel last week on shiners. Atlantic menhaden are well managed in Narragansett Bay. All signs are pointing an early striped bass season, possibly the earliest season in years. The Bay and ocean water has consistently been warmer than last year. 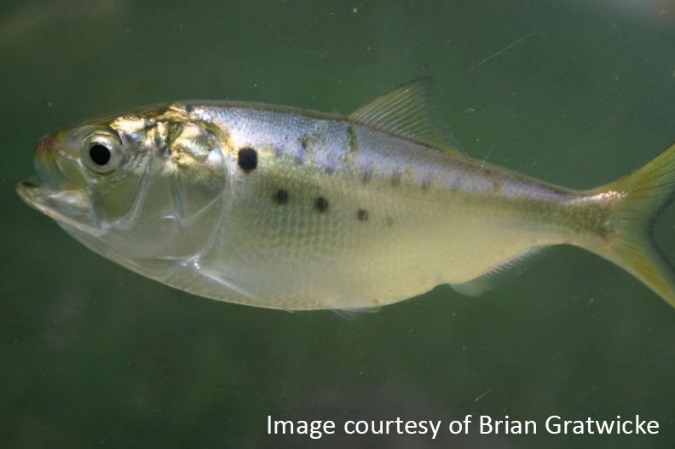 Spring is shaping up as warmer than normal too and there is a high volume of bait such of herring and peanut bunker (juvenile Atlantic menhaden) in our waters. So get your gear ready it is going to be an early striped bass season… possibly as early as next week. This week I was reminded of the outstanding Atlantic menhaden management program we have in Narragansett Bay. Monday night George Purmont, a spotter pilot commissioned by the Marine Fisheries Division of the Department of Environmental Management (DEM), spoke about his work of counting schools of Atlantic menhaden (pogies) from the air in Narragansett Bay. The program is one of the most sophisticated and effective programs of its type in the nation. Purmont said, “Flights once or twice a week give fish managers up to date data.” The program works well for recreational fishermen to protect this forage fish as well as for the commercial fishery allowing the Bay to be fished when there is an abundance of fish in the Bay. The Coast Guard is seeking public input on a proposed 500-yard safety zone for the Block Island Wind Farm (BIWF) by April 17, 201. The Coast Guard proposes to establish a 500-yard safety zone around each of five locations where the BIWF wind turbine generator (WTG) towers, nacelles, blades and subsea cables will be installed in the navigable waters of the Rhode Island Sound, RI, from April 1 to October 31, 2016. These safety zones are intended to safeguard mariners from the hazards associated with construction of the BIWF. Vessels would be prohibited from entering into, transiting through, mooring, or anchoring within these safety zones while construction vessels and associated equipment are present at any of the BIWF WTG sites. Comments and related material must be received by the Coast Guard on or before April 17, 2016. The public may submit comments identified by docket number USCG-2016-0026 using the Federal e-Rulemaking Portal at http://www.regulations.gov . If you have questions contact Mr. Edward G. LeBlanc, Chief of the Waterways Management Division at Coast Guard Sector Southeastern New England at 401-435-2351, or email Edward.G.LeBlanc@uscg.mil . The Block Island Wind Farm (BIWF) will hold an update meeting on Tuesday, April 5, 2016, 4:00 p.m. at the Hampton Inn, South County Commons, and South Kingstown, RI. Agenda items will include the 2016 construction schedule, project crew vessels, the U.S.C.G. 500 yard safety zone and gear boundaries. A separate meeting regarding National Grid's sea2shore cable construction will follow with an announcement distributed as soon as the date is finalized. For information contact Elizabeth Marchetti, Fisheries Liaison at 401.954.2902. The Aquidneck Island Striper Team will hold its annual used tackle sale this Saturday, April 2, 10:00 a.m. to 12:00 p.m. at the Portsmouth VFW, 822 Anthony Road, Portsmouth. For information contact Capt. Eric Thomas at 401.524.7239. The 16th Annual Kids Day at Addieville East Farm will take place Saturday, April 23rd, 9:00 a.m. to 3:30 p.m. Children ages 10 and over may register but must be accompanied by a parent or guardian. Children will learn the basics of fly casting, fly tying, fly fishing (in a trout stocked pond) and basic entomology. The RI Department of Environmental Management, two Trout Unlimited Chapters and the United Fly Tyers of Rhode Island are co-sponsors of the event. Kid’s Day is free however all are urged to register in advance as space is limited. Register with Kimberly Sullivan, 401-539-0037 or email kimberly.sullivan@dem.ri.gov; and Jessica Pena, 401-539-0019 or email Jessica.pena@dem.ri.gov. Kokosing Industrial will be conducting submarine cable installation work from April 1 through June 5 in support of the sea2shore Renewable Link (BITS) and Block Island Wind Farm (BIWF). In a statement last week the cabling companies said they “Respectfully request that fishermen remove fishing gear/traps from the selected cable route, and maintain a clear path 300 feet on either side of the center line. Please see the overview chart for BITS and BIWF cable routes. Kokosing will return to fishermen any gear/traps that may get fouled in the cable equipment but is not responsible for replacement of the gear.